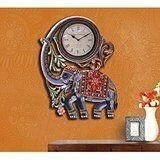 Symbolic of design excellence and superior craftsmanship, this Elephant wall clock is made of wood and comes in a ravishing mixture of several colors that is bound to be a treat to behold! Dimensions : 24 Inches Height x 19 Inches Wide x 1.5 Inches depth , Material - Solid Wood, Certified Quality. * Movement Type: Quartz ,* Battery Required: AA Size Battery,* Number of Batteries Required: 1,Time Display: Pointer,Battery Included: No Dial Size : 8 inches Our Clocks are timeless classics to say the least ! Each piece is carefully Hand Crafted by the deft hands of artisans who have traditionally created products for the Royal families of India Whether the look of your room is Country, Cheerful, Chic or Classic, we have a Clock for every wall in your home. Peacock Figurine Wall Clocks Decorative living room Weight : 3.6 Kg Please note due to handmade and painted there might be some difference. Disclaimer - This is Collectible India's exclusive Inhouse design & Production. For authentic product & design, Pls ensure to buy from ' Collectible India ' seller. BEWARE from copy products & collectible India is not responsible for the same.